Team Arrow starts there first day on the job with the SCPD and is being trained on the rules and protocol they must follow if they want this new deal to stick. At home, Felicity complains about training day and the mayor, but Oliver attempts to get her look on the brightside. He tells her that this partnership has to work so their children can be raised in the city safely. She asks Oliver to keep her pregnancy a secret for a little longer. The SCPD gathers together to go over a gang war case, where three people have been murdered with a drug that melted their face off. Felicity offers to use her expertise but Dinah suggests they do things by the book. Dinah gives Oliver some information about the Blackout Gang. Oliver suggests visiting the rival gang, Los Halcones but Dinah doesn't think its a good idea. Laurel gets a call from Slabside. She goes to visit Turner who tells her Diaz is dead. He promises to give her the name of Diaz's killer if she gets him released. She says he can't do that, so instead he asks to see his son. Dinah has to inform Team Arrow about the changes Pollard has enforced including wearing police uniforms and using standard issued weapons. On the mission the Blackout Gang mentions Mr. Midas, a CEO at a medical company. A miscommunication between SCPD and Team Arrow allows the Blackout Gang and Midas' men to escape. Dinah tries to stop them were her Canary call but she's unable to use it. Team Arrow and SCPD argue about the mission. Felicity gives the team some information about the chemicals and it all connects to Midas Medical. Dinah wants to wait and get a warrant, but Oliver doesn't think that'll work. Felicity and Oliver decide to bring in Midas themselves in order to get SCPD to start listening to them. Rene and Dinah argue about where she stands. Oliver and Felicity confront Midas and get him to confess to making and selling those chemicals to the Blackout Gang. However, the SCPD has to let him go because of the way Oliver and Felicity went about capturing him. Mayor Pollard reprimands all of Team Arrow including Dinah. Dinah gets mad at Oliver for not trusting him. Laurel brings Turner's son to him. In return Turner tells Laurel that he saw a person in a green suit that wasn't Oliver kill Diaz. 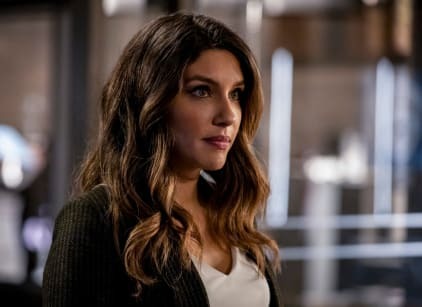 Dinah tells Rene she can no longer be the Black Canary because she no longer has her cry. Rene tries to convince her she's still the Canary even without the cry. Oliver and Felicity arrive at the bunker and are joined by Diggle. Diggle asks why Oliver's giving up on this partnership so quickly. Felicity tells Diggle that they are having a baby. They tell Diggle they want to raise their kid in a safe city. However, Diggle reminds them going back to the way they used to do things won't change anything. In order to protect Star City they need to do something differently. Dinah and Rene come to the bunker. Oliver and Rene both apoligize and Felicity gives them the information she obtained legally that they need to get to Midas. The team suits up. Team Arrow finds Midas, catch him and get the evidence they need with the help of the police department. After the mission, Dinah informs them that she used some leverage over Mayor Pollard to allow them to form a special vigilante task force. Diggle and Felicity stay behind while the rest of the team goes to the bar. Diggle tells Felicity he knows what she's working on is something much bigger than a security system. Laurel gets Emiko to visit her in her office. She tells her she knows what she did to Diaz. Laurel threatens to tell Oliver, but Emiko tells her they won't believe a word she says because she's the Black Siren. At home, Oliver and Felicity talk about baby names and Oliver brings up Mia, short for Moira. Mia and William arrive at an underground black market to get an answering machine. Mia tells William to stay put while she deals with the criminals. However, William finds what they're looking for and bargains with the seller. William gets bumped into by a little girl. Mia gets mad at him for not staying put. He says he got the machine but can't find it. Mia realizes the seller Felix tricked William. Mia goes to confront him but Felix threatens to get the SCPD involved, and William drags her away. Mia tells William he should've let her beat up Felix and the police. William tells Mia she reminds him of Oliver. William gets Mia to get him a device that allows him to pretend to be a member of the SCPD. He sends the police away by saying he's got a Canary sighting. Mia and William use the distraction as a way to get the answering machine from Felix. William plays the message from Felicity. She apologizes for keeping them a part. She gives them coordinates to give to the team and then asks them to leave Star City and not look for her. Mia and William agree that they are ignoring her request. Mia realizes these coordinates lead to the Glades.